Have you seen the cool shoe tokens your child has earned at Sunrise Steppers??? Each token represents a mile of running or walking around the big field. Every Friday, hundreds of students and teachers choose to skip their lunchtime recess to run or walk laps around the big sports field for 20 minutes. 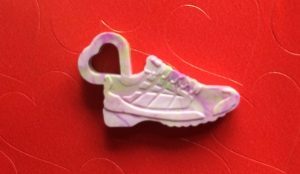 Students who complete a mile receive a plastic running shoe token that they collect and proudly wear on a bracelet/necklace chain. Steppers is a wonderful program that promotes exercise, healthy lifestyle choices, friendly competition and community spirit within the school. Together, students and teachers have run/walked approximately 5,000 miles this school year – the distance from Tucson to Dublin, Ireland (assuming they could run across the top of the Atlantic Ocean)! To recognize and reward their dedication, we had a special Steppers Fun Run on Friday, March 3rd, 2017 the Big Field (behind the playgrounds). Family members and a volunteer team from the Nike/Converse store were there to help out and enjoy the day. We had lots of help to make this special day a success. Please consider volunteering through MySchoolAnywhere to make this event super special for all our super runners! If you have any questions about the event or volunteering, please contact Valorie Colson (email). 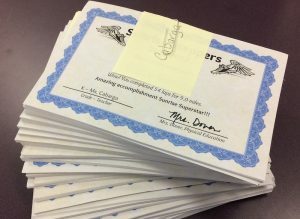 Stack of over 560 certificates given out to students for their accomplishments!